The awe-inspiring, adventure-loving, science-doing, energy-literacy series co-created by EAST OF WEST’s Nick Dragotta returns with an all-new story from superstar creators Fred Van Lente (Incredible Hercules, Action Philosophers), Tom Fowler (Mysterius), and Jordie Bellaire (PRETTY DEADLY) in HOWTOONS: (RE)IGNITION #1. Tuck and Celine’s parents put their family in suspended animation to ride out the ecological apocalypse—but when the kids wake up to find Mom & Dad are gone, they have to make their way across an exciting and sometimes scary new world to find the ‘rents… depending on only their HOWTOONS projects to survive! “I was thrilled and honored Nick and Ingrid [Dragotta] asked me to be part of theHowtoons team,” said Van Lente. “We've come up with a story that should excite and delight both kids and parents and teach them about every known kind of energy through super fun projects. And that Fowler and Bellaire art will make this a post-apocalyptic adventure for the ages (and all ages)!" 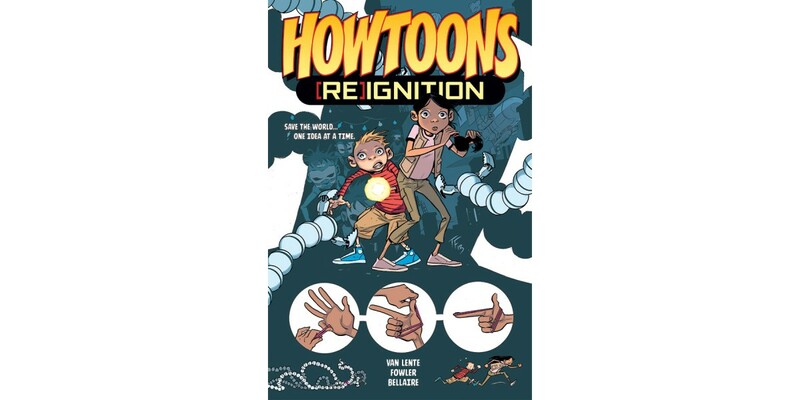 HOWTOONS: (RE)IGNITION #1 arrives in stores on 8/6, and will be available for $2.99. It can be pre-ordered with Diamond Code JUN140484.